As we know by now, the Apple iPhone 7 will almost certainly be ditching the industry standard 3.5 mm headphone jack in favor or Lightning connected headphones and wireless headphones (not to mention adapters that you'll have to pay for.) 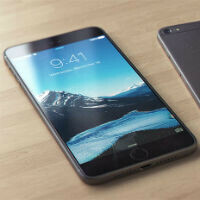 Now, we can get a better idea of what that might look like with a new concept render of the iPhone 7. Now, obviously there's no reason to believe that the rest of the concept render will look anything like the real iPhone 7, but it is very interesting to see a device with no headphone jack. The concept is by Arthur Reis, and there is a video for it, but the video goes a little overboard from concept into dream territory, so we're not going to bother including it here. Some things mentioned are possible based on rumors, like water resistance or wireless charging, others have been ruled out based on reports like an AMOLED display or wireless earbuds. Additionally, there have been rumors that Apple is getting rid of the antenna lines that people don't much care for. So, really the one part of this concept that should be taken as highly likely is the fact that the bottom edge of the phone doesn't have a headphone jack and has a second speaker grill instead. In pictures, it looks fine, really. But, then of course you remember that there's no headphone jack on the top edge of the phone either and the silly decision comes full circle once again. One of the stupidest ideas in a long time..
"Replacing existing technology with better new tech sure is the future" Yeah sure. I agree. But, there is no way bluetooth for music listening is better than jack right now. Why? Audio compression! If you are almost deaf, then ok, you won't feel the difference but for anyone with a functioning ear, bluetooth is totally sh*t. By removing the jack port, there is no use to keep providing a DAC( quite good for the iphone) inside the smartphone, so the overall quality of the sound will only depend on the DAC included in the earphone/headphone. Some people will have (bad) surprise buying stuff with s**tty DAC. To conclude, replacing existing techology is better when the new tech is better, which is not the case for bluetooth. Have you tried using a pair of Jaybird BlueBuds X? They're the best sounding headphones I've ever owned, and I've tried: - Stock apple earphones n earpods - Philips Surround sound headphones (these were the best prior to my BlueBuds X) - Even once fell for the Power Beats by Dre garbage However, how good they are, I'll be comparing them against these USB OTG digital headphones (http://www.zorloo.com/) whenever they arrive for my OnePlus One. SAME copy of ip6.. No changes AT ALL.. I would understand removing a standard by replacing it with another standard (Floppy to CD etc. ), but replacing a standard with something proprietary? Now that is stupid. Is september early this year?? i'm confused. iDevices are the most anticipated devices on iPhonearena, what's confusing? Its confusing because there is like 7 more months before the thing gets launched. Since i am a new phonearena user i dont know if the same happend before 6 was launched!! Looks more than thick enough to contain a headphone jack, but then so was the extremely inferior 2015 MacBook more than thick enough to contain more than 1 full size USB port (https://goo.gl/oAu2Ss)...makes iSense for them to remove it.